Why There are Atheists in Church… YOUR church? Your PASTOR? Now this is a big topic… disbelief in God or “losing faith”. We won’t do it full justice here. Rather, a few thoughts. The fact is, there are lots of atheists in churches. Now even an “atheist church” (or maybe a few). We think of a church, in the people sense, as a community of believers in God. In the US, the large majority of churches involve those who also believe in Jesus, whether Jesus as God or Jesus as an important example or standard bearer. To keep things simpler, let’s just consider the belief in God aspect and why even your own church may have one or more atheists in it. Most believers might think an atheist could be among them because he or she is seeking God, and just not yet able to believe. I expect fewer believers would suspect that a long-time member who has always said and done the “right” things might be an atheist. But they might! In a church of a few hundred or more, I’d venture there is an atheist or two (maybe three, four or ??). That’s without searching out statistics, which I’m not sure have been obtained, at least reliably. One reason atheists in church are hard to “pin down” is many people aren’t sure if they themselves are one or not! Maybe eventually they realize they are, but aren’t sure when it happened. So there… we are getting at one of the main reasons atheists go to church! They always have. Perhaps from birth. At least from youth. Church has become a habit, but more than the typical habit. To such people it’s probably also a place to keep up with one’s friends, to get support, to share in the pains and pleasures of life! Not easy to let go of. And if the church is relatively small, everyone will notice if you disappear. For sure your family will! They will ask questions… questions a doubter or new atheist may not want to answer. So now the question, “Why have these ‘faithful’ come to lose their faith?” Wow, is that a big question! So just a skim over the surface of the possibilities here. First, the answers one might hear from within one of the same churches (of the Evangelical or fundamentalist type predominant in most parts of the US and similarly in most of the world): They have been deceived by the Devil. One problem with this explanation is that some of these people are the least likely to be deceived — careful thinking, ethical and “righteous” in behavior, often also devoted to God and to Christ. 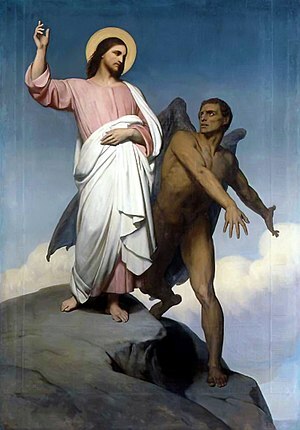 Maybe it’s thought that some sin allowed the Devil a foothold. But who hasn’t sinned in one way or another, even as a believer? Another supposed explanation for someone’s doubt or appearance of disbelief: They got too much education! Yes, indeed, too much education. Maybe it often isn’t put quite that way. But too much of the wrong kind of education — from the secular or “liberal” point of view. That might include higher education at anything other than a conservative Christian college or university. Or it might mean reading books by liberal or progressive theologians. You know, those with an “historical-critical” approach to the Bible (or you may not know: this approach does not assume the historical accuracy of the Bible, nor the traditional assignments of authorship, suggested dating, etc.). Now this explanation is accurate, at least some of the time. But, one must ask, is the process a bad thing? Something to necessarily be avoided — getting input from a skeptical or deeply exploring point of view? Even loyal Evangelicals have long noted the “scandal” (a term used by historian Mark Noll in a prominent book title) of the kind of thinking and intellectual attitudes and patterns that are common in the evangelical church world. (“Evangelical” used as an adjective here.) I am not an atheist myself, but my shift from an Evangelical and “supernaturalist” viewpoint to progressive (specifically, “process”) theology is the result of many years of “subjecting” myself to this examination process and engaging it actively. So this same process accounts for some of the atheists among churchgoers. Many people, especially young adults, are reading biblical studies and theological books from an historical or theologically progressive point of view, leading some of them, at least temporarily, to atheism. Or they hear talks by some of the same authors or read books and hear talks by atheists. Despite the media publicity for the more aggressive (“New”) atheists and the best-seller status of their books, I think they convince relatively few people. At least to full “conversion” to atheism. Probably more influential are the former type of authors and speakers, most of whom do not consider themselves atheists. Now, could even your pastor perhaps be a secret atheist? Well, it seems to be getting more common for either “mainline” churches (mostly older, larger denominations) or Evangelical/fundamentalist ones to have pastors who become atheists. In some cases, the process toward this begins in liberal seminaries. But more of the time, Evangelical pastors are educated in Evangelical seminaries or may not even have attended seminary. Rather than examine further how they become atheists, let’s take a quick look at why they may stay in ministry as atheists. If not atheists, at least as more skeptical about the trustworthiness of the Bible, the deity of Christ, etc., than most of their parishioners. Here I’m going to try to paraphrase former Pentecostal pastor and now atheist, Jerry DeWitt of The Clergy Project. I heard him just last night (11-8-13) on “Q” with Jian Ghomeshi, a CBC radio program which airs, via Public Radio International, in some US cities. His take on part of the reason a pastor might continue in his or her role, based on the person’s own situation, is that it may remain rewarding to help others with support and continuity in their community, the place which helps them structure meaning in life. Still, as in DeWitt’s own case, ultimately the lack of integrity between words and actual beliefs does not allow a pastor to indefinitely serve a congregation with fundamentally different beliefs. However, pressing practical needs, such as a way to feed one’s family when few other viable options exist, may keep such a pastor in position longer than they would otherwise prefer. One would hope that Christians, motivated by love, would understand and help such a pastor find alternate employment. But seldom is that the reality, if ever (I don’t know of such cases, though they may exist). Rather, a pastor’s fear of real anger and acrimony from parishioners often turns to reality. Probably more so the longer the pastor has stayed after a basic change of belief or a full “loss of faith”. But when do normal doubts turn to actual disbelief? I’d suspect the person himself or herself often does not even know. One of the reasons Jerry DeWitt has helped kick off The Clergy Project is to aid pastors in transition, including with practical needs like finding new sources of income. I suppose, in relation to this process for many lay people as well as some pastors moving toward or into atheism, the least we might hope for in the short-term is that people will more deeply understand and accept that personal beliefs do change. They change in all of us actually, though perhaps not as radically as from God-belief to atheism. And with that, we might hope more Christians will loosen the grip of certainty they have that unbelievers are deceived by Satan, rebellious against God (and moral standards, etc. ), and (sadly) bound for eternity separated from God and believing loved-ones. ← Making Marriage Last – Do Atheists Do It Better?